Mario, Luigi and Bowser team up for a big adventure. Now they’re words we wouldn’t have thought we’d type, unless we hadn’t played Mario & Luigi: Superstar Saga on the Game Boy Advance back in 2003. For once, the big green spiky mean dude isn’t the antagonist here, but it’s only because it suits him. 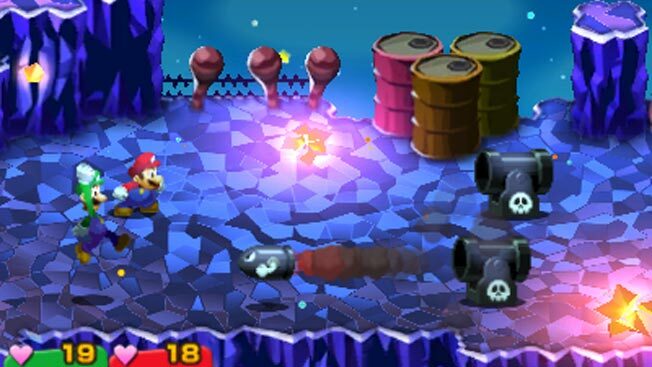 You see, Cackletta has stolen Princess Peach’s voice, replacing it with explosives. Yep – she speaks, she drops word bombs. Real bombs. Bowser doesn’t want to kidnap her in this state, as her language may damage his lovely, lava-filled castle. So, they join forces and head off after Cackletta and her henchthing, Fawful, to rescue Peach’s voice. This means visiting the neighbouring Beanbean Kingdom (which is, of course, right next to the Isis kingdom...) Will the Beanbeans help our intrepid heroes (and Bowser)? Or will they become has-beans? It’s a big old turn-based RPG thing, but with massive smatterings of Mario lore that make it less po-faced. It’s also quite funny at times. From simple jumping upon the bonces of enemies to going full whirlwind right through them, you level up, get more powerful – you know the drill. Then there’s the bonus game which unlocks once you’re a reasonable way into the main adventure. Running alongside the main story (but optional), Minion’s Quest: The Search for Bowser sees the Goombas trying to track down their boss and rescue him. Rocking a sort of Fire Emblem vibe, you equip units and go for baddie takedown.